Sangiovese is Italy’s most widely planted red grape: it is held in high esteem in Tuscany where it is the core for noble wines such as Chianti, Brunello and Vino Nobile di Montepulciano. 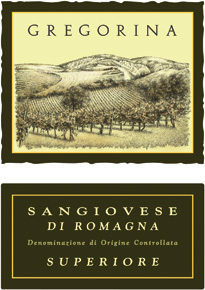 However, Sangiovese is also grown in many other regions of central Italy, including Abruzzo, Marche and Emilia Romagna. Terra del Sole, where the Gregorina estate is located, shares many similarities with neighboring Tuscany. The soil is clay-limestone and the climate is kept mild by the nearby Adriatic sea. Late summer rains are scarce, so the grapes enjoy excellent conditions for ripening until the end of September, allowing them to build up a high concentration of sugars and smooth tannins. Sangiovese grapes from Emilia-Romagna generally produce wines that mature more quickly and possesses a richer fragrance than Tuscan Sangiovese. Gregorina Sangiovese is vinified in stainless steel and sees a brief ageing in oak barrels to enhance complexity, without overwhelming the wine’s varietal freshness. A vibrant combination of earthy and ripe, dark fruit flavors. Full bodied with intriguing tannins on the finish and a lively acidity that keeps the palate refreshed and wanting more. It will pair beautifully with first courses with savory sauces, pasta, medium-aged cheeses and all sorts of meat dishes. Hand-harvested grapes undergo a controlled winemaking process to preserve typical varietal characteristics. The wine is fermented in temperature-controlled stainless steel tanks to obtain optimal extraction of fruit and soft tannins. Malolactic fermentation is followed by a short period of subtle oak aging to enhance complexity, without overwhelming the wine’s varietal freshness. 2 months in bottle prior to release.